Hervé: We talked to Kazu Kibuishi, the 26 year-old writer and illustrator of comics and films and creator of Viper Comics' upcoming Daisy Kutter four-issue mini-series. Hervé: You describe yourself as writer and an illustrator. Which one are you the most? That's a tough one. I like to consider myself a writer first, but I see myself using drawings to write my way through a lot of situations. It's hard for me to separate the two, but if I had to pick one over the other, I guess I am much more a writer. Hervé: How does the creative process works for you, in terms of mixing scripts and art? Hervé: As a writer/artist, you're used to working on your own. How is it to collaborate with others on creative projects? Actually, I am pretty accustomed to collaborating on large projects, so it felt pretty natural putting together Flight Volume One. The difference with Flight was that everyone also had their own little corner of the project, and they were solely responsible for making that part work, with some assistance and inspiration from the others. I think this is the ideal work environment for creative projects. Hervé: What was your first published project? Hmm, if you count school newspapers, then the illustrations I did for my High School and University newspapers would be my first published works. I also drew Copper in the pages of Yolk magazine, and some spot illos, comics, and covers for other magazines and newspapers. As far as full-length comics work, my comic in Flight and the first issue of Daisy Kutter will be my first real printed material. Hervé: Did you create stuff in art school? I didn't go to art school. I studied film, but I drew comics and cartoons for the school newspaper in the evenings. Hervé: Did the stuff they taught you back there any useful for your work today? Well, the film theory and analysis knowledge helps a lot, actually, but I think the best knowledge came from just drawing cartoons day in and day out for the newspaper. Hervé: How do you feel about deadlines in a creative environment - I mean. Is it tough to go through creating a comic book series on time? Hervé: How did you hook up with the folks at Viper? Hervé: What about the Flight Anthology? 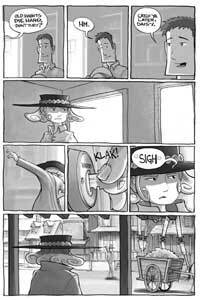 Hervé: Daisy Kutter's style and themes seems different from some of your other projects. Is this new grounds for you or something you've been working on for years? I actually used to do a lot of highly rendered work. Believe it or not, back in High School my stuff looked a lot like Stephen Platt and Simon Bisley's work, with a slightly wacky and cute vibe to it. Haha. I see what I'm doing with Daisy to be what I intend to be doing a lot of in the near future. Basically, I'm trying to find a nice balance between the iconic and the realistic, to develop a natural style that's easy to read, and keeps everything looking and feeling alive. Hervé: The guys at Viper separate the creative from the business very well when managing the company. Did their creative input helped you a lot for Daisy Kutter? Well, I would trust Jim Resnowski with any creative decisions he makes since he's a seriously talented designer, but so far I've pretty much been left alone with total creative control on the project, which is great. They put a lot of trust in me, and I try to repay them by doing the best work I possibly can. Hervé: You seem to have a lot of fans, yet many have never heard of you. Where have you been all this time?! Haha!! The internet is an amazing thing! Hervé: How much time did it take you to built your community at Boltcity.com? I've been doing this for about 2 years now, although my site started as a portfolio site at first. Once people stumbled onto it, they started spreading it around the web. A lot of web design and cartoon sites seem to like it, so I get a lot of artists and designers visiting daily, it seems. Hervé: When working on Daisy Kutter, is there any type of music or soundtrack that you think would fit well with it? 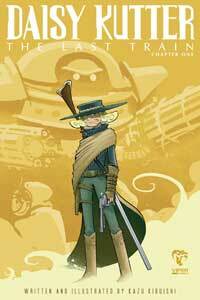 Hervé: Did the Japanese series Cowboy Bebop influenced you on Daisy Kutter? Oh yeah, definitely. I think they share very similar attitudes. 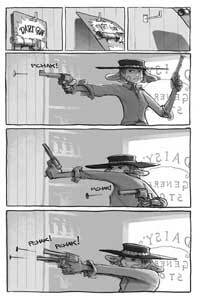 Daisy Kutter is very much a distant western cousin of Cowboy Bebop. Hehe. I love that show! Hervé: How about Star Wars! I mean, you have those giant walking robots? I was never a big Star wars fan as a kid, since I didn't actually see it until much, much later in life. Once I did see it, however, I fell in love with the designs of the machines. They were so clunky and they looked like people actually used them. It really reinforced the mythology of the Star Wars universe, so I wanted to apply that to Daisy's world. 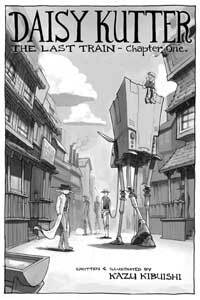 Hervé: It seems that westerns and sci-fi are always a good mix. Any insight on that? Hehe. I haven't seen too many people do it well. I only do it because I like to draw robots and I love the visuals of the spaghetti westerns. Most of the time, I don't even think about it at all. I just put a robot or a giant mechanical horse in there because it just feels right. Hervé: What is Daisy Kutter's background? I'm looking forward to finding out! Hervé: How different is she from other tough girls? Hmm. Well, she's also really cute and her hair always looks pretty good. She might be a tough girl, but what's important is that she's still pretty much just a girl. Hervé: There's a cinematic feel to your storytelling. 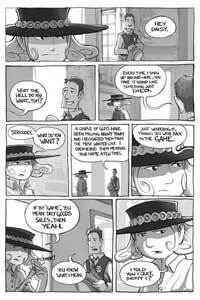 How do you feel about this particular storytelling approach? I studied film and I was trying to pursue a career as a filmmaker, so I guess this is a natural progression. Since I tend to see everything cinematically, it just comes out that way on paper. I also see my comics as being really inexpensive but high concept films. I feel like I can express the same idea that costs a major film studio millions of dollars, with only five bucks and a little bit of my time. The coolest thing about comics is that I'm limited by only my imagination and drawing skills. Oh, and my laziness, of course. Hervé: You seem to pack more per pages than the current rate of most comic book artists these days. How do you feel about using a more traditional page layout? Hervé: From the samples of Daisy Kutter that I have seen, it seems that you've plotted the story pretty tight and used standard but effective pacing and story building techniques. Are you also comfortable with looser plots and more introspection? Oh yeah. I plan to delve into some of those tangents later. I had this entire story in my mind from the beginning, and it's probably the most tightly plotted piece I've done. I'm sure as time goes on, I'll start working looser as I get more comfortable. Hervé: What are your long term plans for Daisy Kutter? Hmm. I dunno. I'm just playing it by ear now. Hervé: What else are you working on right now? Hervé: When can we expect Daisy Kutter to hit the stores?